We offer you, "The Grocer" the largest selection of Grocery Labels available anywhere. All Scale Labels are manufactured to the specific manufacturers specifications for dependable performance in your scales. ScaleLabels.com has five full service order fulfillment centers located in Arizona, California, Ohio and two in Wisconsin. This enables us to provide our customers better service and faster, less expensive shipping. After receiving your order we will determine the most cost effective way to ship your order, and Pass all UPS Discounts on to you, your shipping charges will be adjusted before your credit card is processed. We invite you to browse thru our store and shop with confidence. Create an account with us if you like, or shop as a guest. Either way, your shopping cart will be active until you leave the store. Special Pricing for Quantities larger than those shown is available. Please call for Special Pricing! Antonson scale labels are available for all makes and models. If you don't see your Antonson Scale Label listed please call us at 800-968-5749. Avery/Berkel scale labels are available for all Avery/Berkel scale models. If you don't see your Avery/Berkel Scale Label listed please call us at 800-968-5749. 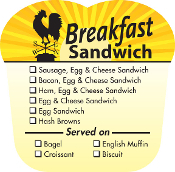 Searching for the perfect labels to mark your breakfast items? We Have Them! CAS Scale Labels for the Cas LP-1000 Scales in the following formats: LST8000 Non UPC, LST8010 UPC, LST8030 Non UPC with Safe Handling, LST 8040 UPC with Safe Handling, LST8020 Ingredient, and Continuous Strip. Cardinal Detecto Scale Labels for the Detecto DL1030/DL1060 Scales in the following formats: LST8000 Non UPC, LST8010 UPC, LST8030 Non UPC with Safe Handling, LST 8040 UPC with Safe Handling, LST8020 Ingredient, and Continuous Strip. COOL stands for Country of Origin Label and is now found on many foods sold in grocery stores in the United States, including meats, poultry, fish, some raw nuts and produce. These new labels state which country the food came from before it made it's way to the grocery store. Coupon Labels are a great way to give your product a sales boost. Coupon Labels available from .50¢ Off to $5.00 Off. 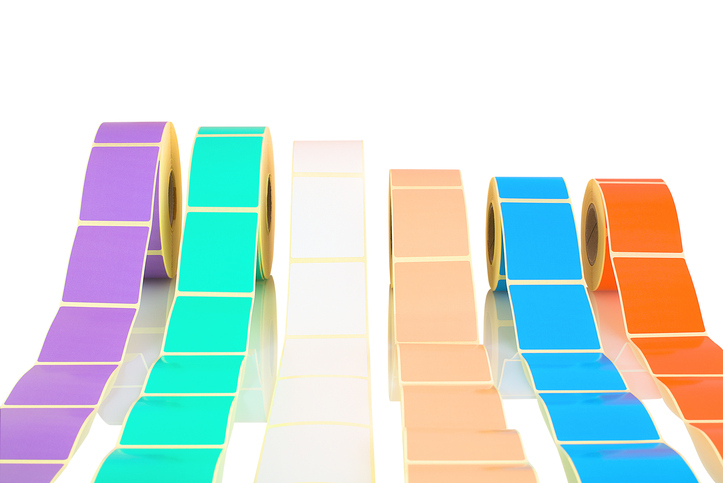 Industrial Thermal Labels are ideal for high-volume printing, or one label at a time. Our labels are compatible with a wide variety of printers which include Eltron®, Zebra® and Datamax® to mention just a few. Food Rotation/Food Safety labels developed with your imput to help you manage the food rotation & storage guidelines provided by the FDA. 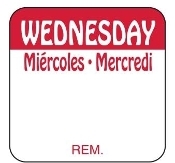 Removable Adhesives, Permanent Adhesives & Dissolvable Labels. Our goal is to provide efficient, economical, and innovative ways to label you foods in compliance with Federal Food Codes, as well as additional food safety products. Share the holiday spirit with your customers, we carry a full collection of Holiday Labels. Mettler Toledo Scale Labels for the following Toledo Scale Models: 315, 325, 350, 8460, 8425, 8427, 8442, 8450, 8860 UCST and Impact. The lowest pricing you will find anywhere on the Internet. All scale labels listed are in stock for same day shipping. Monarch Price Guns and Monarch Labels available for all Monarch Handheld Price Gun Models. These label guns are light weight, durable and easy to use, to provide you with years of trouble free service. Scale Labels for NCI Scales. We currently stock only the NCI 3450 UPC label. 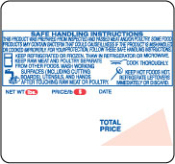 We will print the following NCI labels: NCI 1" x 3" Black Spot label, NCI 3450 UPC Expanded Text label with or witout Safe Handling Instructions or the NCI 1150/1151 UPC label. Call 1-800-968-5749 for details and pricing. With our Nutrition Fact Labels for Beef, Chicken, Lamb, Pork and Turkey you will meet the U.S.D.A. Ground Meat labeling requirements. 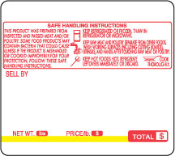 PENN Scale Labels for Penn weigh scales in the following formats: Non UPC Labels, UPC Labels, Non UPC with Safe Handling Instruction Labels, UPC with Safe Handling Instruction Labels, Ingredient Labels and Continuous Strip Labels. Dayglo Labels, Price Point, Bullet labels. ScaleLabels.com price points from 49¢ up to $2.99 are available, and many more such as "5/$5.00" and "Buy One Get One Free", Pick 5 for $19.99 and several Reduced Labels. Supermarket checkers can easily identify fruit and vegetables with labels. Labeling your produce increases profits by collecting the correct price for the item. Sign Cards and Shelf Talkers can be easily displayed to annouce Special Sales, New Products and Department Deals. Tec Scale Labels available for ALL Tec Scale Models. Tec HP-18 UPC, SL59-30, SL57-30, SL66-30, SL-6600, Tec H-240 Floral, Tec H-1700, Tec SL-9000, Tec H-9100, Tec SL5300. Call 1-800-968-5749 if your label is not shown. ALL Wild Game Labels are custom printed in Avondale Arizona, and will ship separtely from all other labels ordered. NO Refund, NO Return. We DO NOT SELL MEAT!